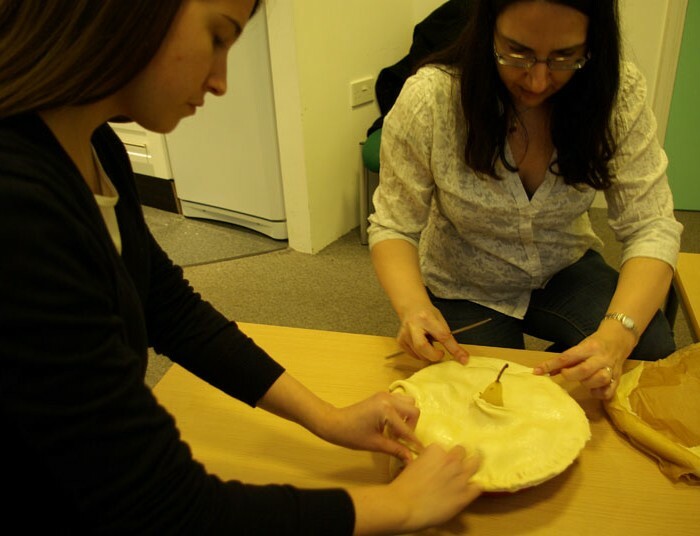 Chelsea and Christina were our willing helpers and ‘guinea pigs’ for the latest Cooking Up History session. They joined us in the Archives kitchen on a rather grey and damp autumnal day. 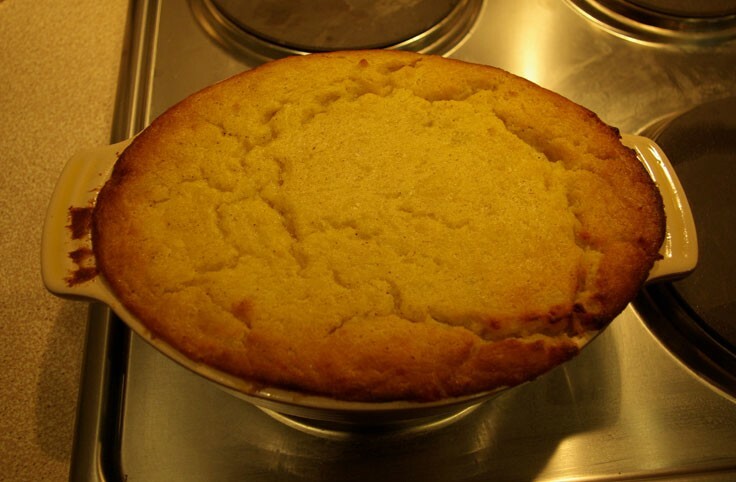 It was perfect weather for sampling a seasonal menu of warm potato pudding and a warden pear pie, both 18th century dishes from our Cookbook of Unknown Ladies. 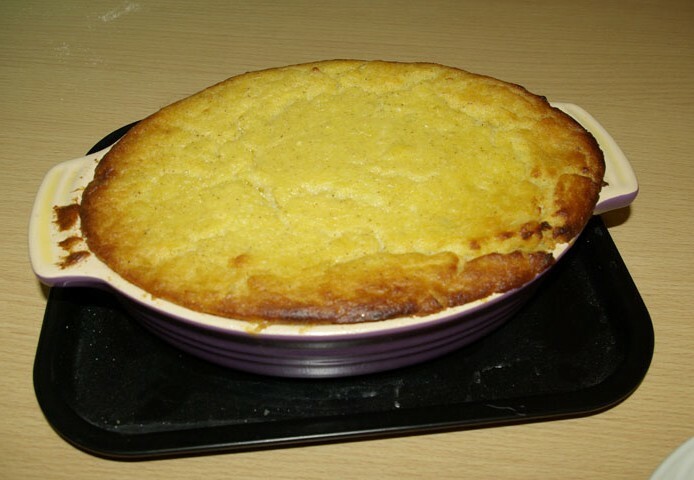 Potato pudding was a rather comforting prospect on a cold and damp Friday afternoon. Having peeled, boiled and cooled our potatoes in the morning, we were all set to combine our ingredients at the start of the session. Chelsea mashed our potatoes vigorously with a fork before adding the melted butter, cream and sugar. We then whipped up egg whites with a fork (foregoing the modern kitchen aid of an electric whisk) and added this to our mixture along with ground nutmeg, orange juice and a generous tablespoon of brandy. The pudding didn’t looking particularly appealing at this point but we were pleased that the method had been so straight forward. Happy that everything seemed to have gone to plan, we popped the pudding in the preheated oven. Even though the unknown ladies’ recipe gave us a suggested cooking time for the pudding, there was no indication of oven temperature. We kept a close eye on it while it was cooking, removing it from the oven only to return it several times, until we were satisfied that it had cooked through. After 1 hour and 15 minutes of cooking time, and a further 10 minutes to allow the dish to cool and set, our patience paid off and we were able to sit down and enjoy the end result! In fact, it was delicious! The delicate flavouring of the nutmeg was particularly pleasant and, balanced by the brandy, was not overpowering. The potato provided a nice texture and we didn’t even mind the few lumps that had escaped Chelsea’s fork! 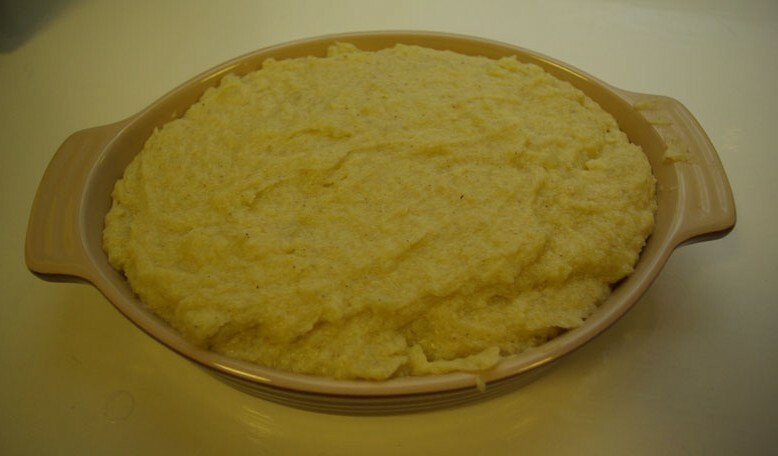 Our conversation turned briefly to modern day equivalents of this dish, with Hilary noting its resemblance to semolina and Chelsea commenting on the similarities between our dish and sweet potato pie, a traditional dish from the American South. 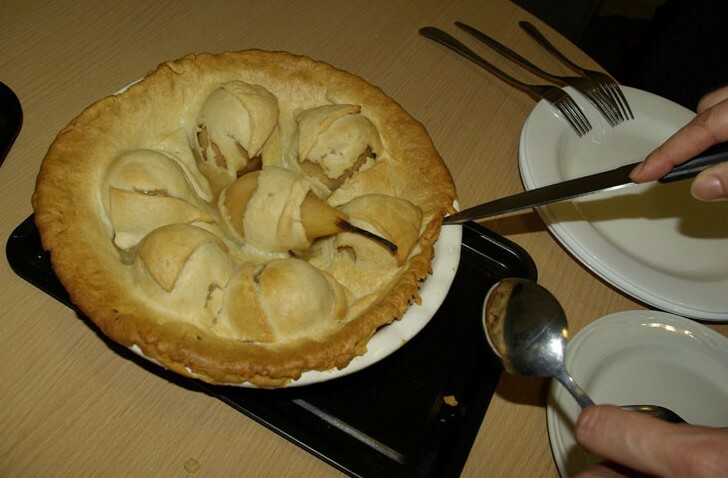 Our warden pie was keenly anticipated by the archives staff, all of whom wanted to try a piece of our fresh pear pie. 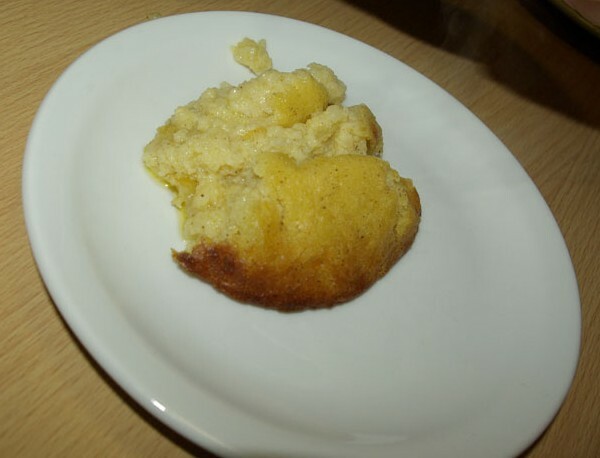 For our Cooking Up History team, however, it was going to be one of their most technically challenging recipes to date. 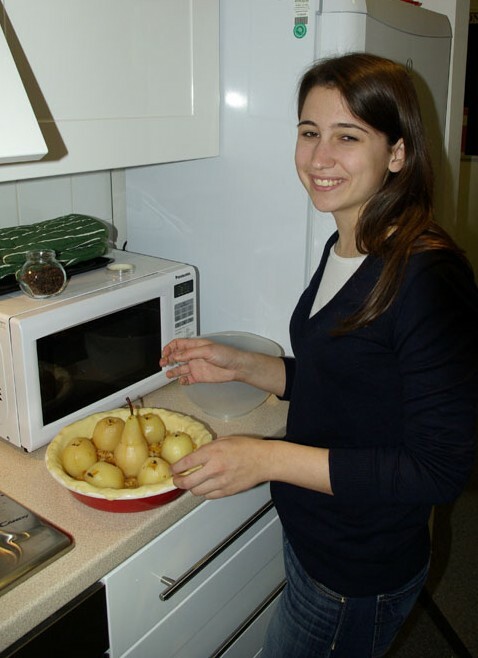 The recipe had proved tricky to adapt for our modern kitchen, as it offered two separate methods for preparing the pears: either stewing them in water with alum, or baking them in a pot with white bread. Both methods were ways of softening the pears without them discolouring. We decided to part slightly from the original, poaching the pears and then dipping them in lemon juice to keep them from browning. 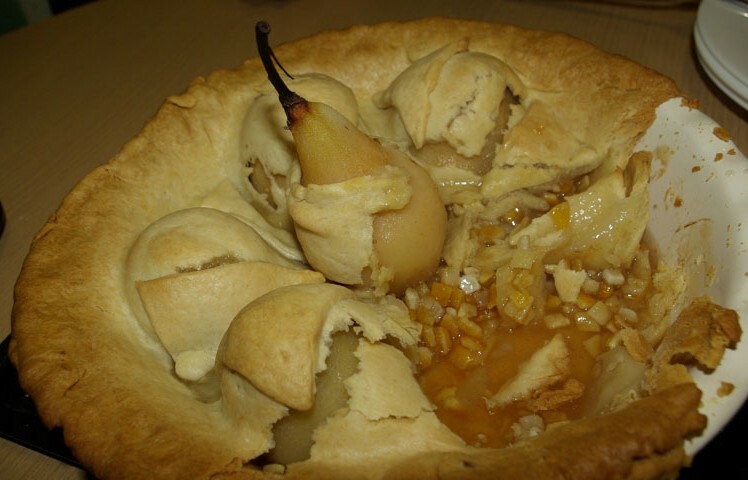 We did follow the recipe’s advice of peeling and coring the pears after they’d been cooked, but in hindsight we felt they would have been easier to handle had we done this before the poaching. It was a pretty fiddly job! Having peeled and cored five of our six pears, we arranged them around the edge of our pastry-lined pie dish and stuffed each one with a colourful mixture of brown sugar, candied peel and cinnamon. 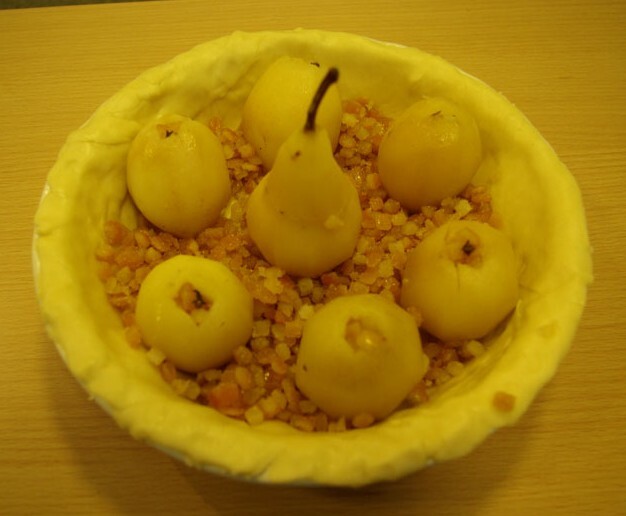 We then peeled the remaining pear and placed it at the centre, scattering the remaining sugary stuffing mixture in the gaps between the fruits. 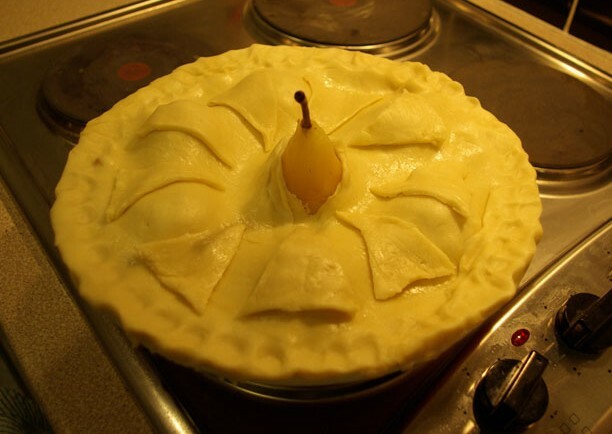 Finally, we placed a sheet of pastry over the top – with a steam hole cut around our central pear – trimmed down the edges and added a few pastry decorations. Chelsea commented that it all looked rather ‘fancy’! Our Warden pie spent a good hour in the oven before we dished it up. The pastry had collapsed a little, but overall it looked incredibly appetising. A layer of sweet, juicy syrup had been created at the bottom of our pie, but we were all pleased to see we had not fallen into the trap of a Great British Bake Off style ‘soggy bottom’; our pastry was crisp all over. The cloves, one placed on top of each of our 5 stuffed pears, offered a stronger punch alongside the candied citrus fruits. None of the ingredients proved overpowering and we all agreed that the pie was well suited to modern palates. The pie went down really well with everyone! We were really pleased that both of our recipes had been such a great success. Replete and enjoying a well earned rest, Chelsea mentioned that at the beginning of the session she hadn’t been able to envisage what our dishes would end up looking or tasting like. It is certainly true that the vague instructions given in many of our Cookbook’s recipes make it difficult to imagine the finished dishes. We noted the usefulness of visual imagery such as photos and drawings in contemporary recipe books. It’s a pity the lady compilers of our 18th century Cookbook hadn’t illustrated it with explanatory drawings and diagrams! You can find recipes for both of these dishes in our Cooking Up History pages. If you try them out at home, don’t forget to let us know how you get on! 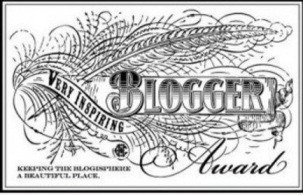 We’re thrilled to have received a Very Inspiring Blogger Award for The Cookbook of Unknown Ladies! We were nominated for the award by Karen Hammonds, who writes the wonderful Revolutionary Pie blog. Inspired by a visit to Colonial Williamsburg, she is now documenting her own mission to re-create the tastes of the 18th and 19th century in her New York apartment. Her site is beautifully illustrated and bursting with enthusiasm for food history – definitely worth a look! The Cookbook of Unknown Ladies is our first foray into the blogosphere, but there are lots of ways to discover our collections online. 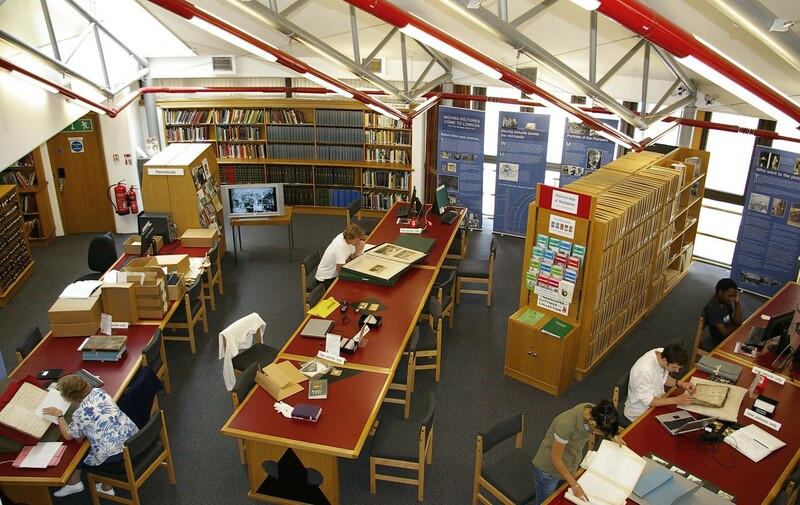 Visit our Archives Showcase hub to explore more of our digital projects, or follow us on Facebook! 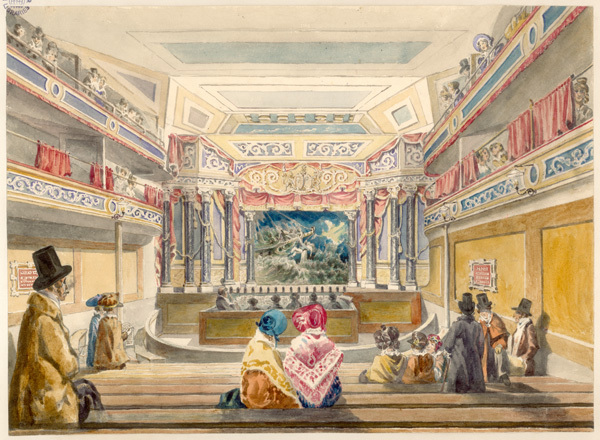 All of the items at the Archives help to tell the story of the development of Westminster, and we have particularly strong collections in Art & Design and West End Theatre. Many people visit us to trace their ancestors who lived in Westminster. Within our parish records you will also find some well-known names. Purcell, Cromwell, Byron and Constable are just a few of the famous figures you might stumble across in the Archives! The Old Foodie – The author of Pie: a global history offers rich pickings for anyone interested in the history of food! Food History Jottings – Ivan Day’s blog never fails to fascinate with its informative and entertaining articles on British culinary heritage. History is Served – This historic foodways blog from Colonial Williamsburg is delightfully presented and a great way to discover cooking techniques from centuries gone by. Bites of Food History – Historic recipes, step by step in words and pictures. Westminster Walking – Few people know London as well as City of Westminster Guide Joanna Moncrieff does. Tired of London, Tired of Life – Something to do in London every day of the year, including lots of great suggestions for history enthusiasts! 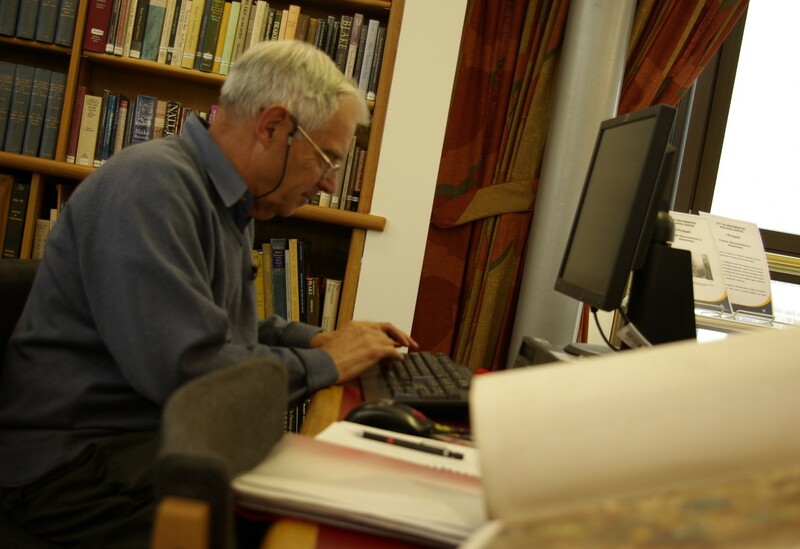 The Library Time Machine – A great blog from Royal Borough of Kensington and Chelsea’s Local Studies Library. Indepth articles along with fantastic images from their collections. Jane Austen’s World – A bit of fun for Jane Austen fans, this lively blog covers everything Austen, and offers a good insight into life in the Regency period. These are just a few of the blogs that have caught our eye. There are many more great sites about food heritage and London history… get Googling! From 1 March 2013, Westminster City Archives invites you to explore over 150 years of English culinary history through The Cookbook of Unknown Ladies. This remarkable manuscript contains hand-written recipes from the early 1700s to the mid 19th century, covering one of the most exciting periods of development in the English kitchen. It is a time of technological innovation and of evolving tastes, as the price of exotic imports fell with the ever-widening reach of British trading routes. Georgian and Regency culinary habits have surprising parallels with modern food trends. There was an emphasis on the ‘fun’ of food, and on creating dishes to amaze and delight. Recipes for carrot puddings, lumber pie and whipped syllabubs display innovation worthy of Heston Blumenthal. There are also parallels with today’s ‘slow food’ movement. Kitchens drew largely on seasonal, locally-sourced produce, and as far as possible used food produced in their own smallholdings and gardens. The compilers of this Cookbook make their own cheese from freshly drawn milk, fearlessly stuff calves heads, and demonstrate considerable skill in butchery. They appear deeply connected with the food they eat and where it comes from. Mystery surrounds the compilers of the Cookbook. A type-written title page bound into the book suggests that the recipes were collected by ‘various unknown women about the year 1761’. But the handwriting and recipes suggest that the period over which these were collected was in fact much longer. Some of the hands belong to the very early part of the 18th century, and others transcribe recipes from popular published cookbooks of the 1820s. It had also been assumed that the ladies were living in the London area, but on closer inspection of the manuscript there is little hard evidence to support this. Many questions remain unanswered. Was this a family cookbook, passed down from generation to generation? For what type of household were these recipes written? Were our ladies servants and, if so, what was life like for them in an 18th century kitchen? In this blog, we’ll draw on clues from the manuscript to create a picture of our cookbook writers and the world in which they lived. Over the year to come, we’ll be trying out some of the historic recipes from the Cookbook of Unknown Ladies in our kitchen here at the Archives Centre. We hope you’ll join us in exploring the tastes, sights and smells of Georgian cookery by trying out some of the recipes in your own kitchen! 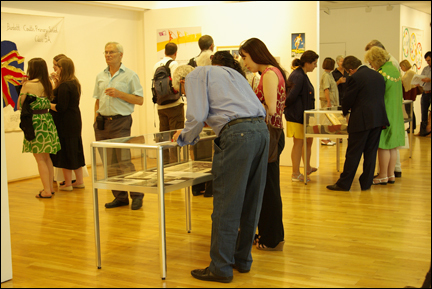 Post up your experiences on this blog, or email us at archives@westminster.gov.uk. We look forward to hearing from you!